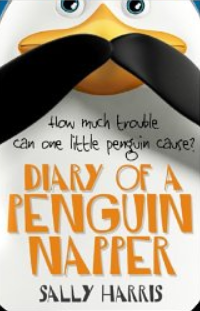 Diary Of A Penguin Napper: How much trouble can one little penguin cause? Well, we are not exactly talking crime of the century, but for two eleven year olds named Marty Finn and Scot Trudman, the penguin caper was a big deal. This book is a middle grade fiction story that combines all those elements of crucial importance to children of that age. Marty has the usual problems adjusting to school, learning to cope and fit in with peers and adults, and finding a way to understand and deal with his first crush. His good friend, Scott owes him due to the fact that Marty has rescued Scot from embarrassment more then once, including the time Scott lost his trunks while diving into the swimming pool. The story begins at the end. Marty is sitting in his living room reading his diary explaining the details of the kidnapping to two police offices he calls Fat and Skinny. That crime of snatching a penguin from the Australian zoo has been thwarted because his mother has discovered the penguin in the attic bathroom. Why would he possibly want to steal a penguin? He needed the money to go on an overnight school trip to the nature center so that he could work with his assigned partner, Jessica, who just happens to be the girl he has a crush on. Marty’s mother had informed him that she did not have the money for the trip; after several attempts to raise money by doing chores and securing a loan at the local bank, the boys realize they have run out of options. But an unexpected opportunity springs up when the wealthiest student in the school offers them $500 to bring a wild animal to his little sister’s birthday party. So Marty and Scott hatch their plot and succeed in bagging the penguin. The end results and punishments have both predictable and unforeseen consequences. This story is written mainly for middle grade students. Fans of Diary of A Wimpy Kid will appreciate the clever entries in Marty’s diaries, the names used for characters, and the offbeat humor. The plot, humor and dialogue are age appropriate and genuine. In addition, the cover is an eye catching design which intrigues the reader. If you are looking for an amusing pleasant read, spend a couple of hours with this one. If you enjoyed this post, please subscribe by clicking on the word Follow or by hitting the orange RSS Feed button in the upper right corner of this post. Love the cover! Sounds like a fun read for middle grade. Yes, just the right combination of elements to make it appealing to so many readers in that age group. Very interesting premise. Thanks for sharing this book at Booknificent Thursday this week! Hope to see you again soon!